Midway through last year the Gospel Coalition published issue 35-2 of Themelios. It is available as a 185-page PDF and in HTML. 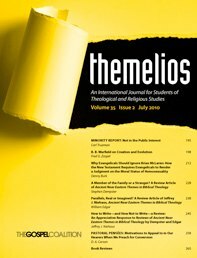 Themelios is an international evangelical theological journal that is aimed towards theological students and pastors.